Tim Hudson just signed with San Fran for 2 years 23 mil. He is coming off a serious injury and is 38. I think the Orioles should be spending their money on younger and healthier players. 11.5 a year is too much of a risk for a low market team like the O’s. 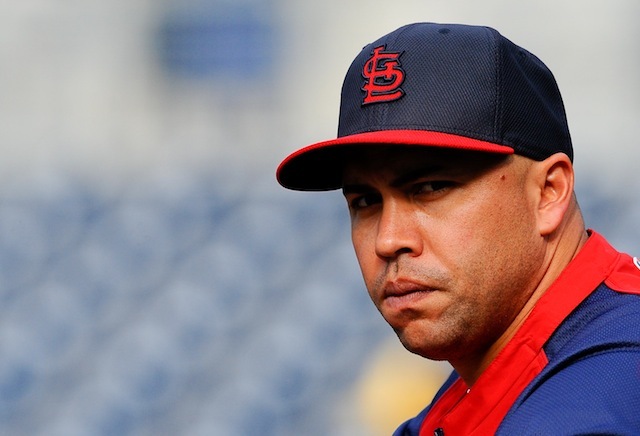 There is also buzz around the Orioles looking seriously at Carlos Beltran. If the O’s are going to spend, this is the year in free agency. It sounds like Beltran wants at least a 3 year deal. Im guessing he’d make around 13-15 a year, and if a bidding war begins, it could be bad news for the O’s. Apparently the Yankees, Red Sox, Royals, and a few other teams are very interested. If the O’s are willing to spend, they should send 3 years 45 mil to Beltran, go pick up a starting pitcher for 8-10 mil a year, sign a right handed power/average hitting DH, and ink Omar Infante or trade for Ian Kinsler(Texas), Howie Kendrick(LAA), or another proven second basemen. These additions to the team could really help the Orioles over the hump of last year in which Nate McLouth slumped, Brian Roberts got hurt, the DH position could not get it together all year, and the starting pitching was miserable. A few, but not all the avalibe veteran starting pitchers include: Ubaldo Jimenez, Ervin Santana, Bartolo Colon, Hiroki Kuroda, A.J. Burnett, Ricky Nolasco, Matt Garza, Josh Johnson, Scott Kazmir, and Phil Hughes. With Hudson signing for 2y 23mil, the top tier pitchers will be looking for the same. This means pitchers like Phil Hughes, Scott Kazmir, Ricky Nolasco and a few others could go for 8-10 mil a year. The question is, would these pitchers be worth it? With Gausman and Bundy on the cusp of being dominate pitchers, should the O’s pull the trigger? Bundy should be throwing in December and ready to go for the beginning of the season. Gausman struggled with command last year, but should preform better next season with the experience he got this year. The current rotation of Tillman, Gonzalez, Chen, Hammel, Norris, and Feldman does not cut it in the AL East. Feldman and Hammel are free agents, and I expect them to walk. Replacing Hammel with Ubaldo/Colon/E Santana/J Johnson could make a huge difference. The rotation would look like (new pitcher), Tillman, Gonzalez, Chen, and Norris. If the 2-4 and stay healthy and Bud Norris gets back to his Ace days at Houston, this could be a very good rotation. This entry was tagged A.J. Burnett, Baltimore Orioles, BaltimoreOrioles Postseason, Bartolo Colon, Brian Roberts, Bud Norris, Carlos Beltran, Dylan Bundy, Ervin Santana, Hiroki Kuroda, Howie Kendrick, Ian Kinsler, Josh Johnson, Kevin Gausman Phil Hughes, Matt Garza, Nate McLouth, Omar Infante, Orioles, Orioles Postseason, Ricky Nolasco, Scott Kazmir, tim hudson, Ubaldo Jimenez. Bookmark the permalink.